You’ve Heard it from The Rest, Now Hear it from Us. Recently information regarding the Canine Flu has been popping up everywhere- online and in print and television news media. Unfortunately some of this “information” is nothing but misinformation. That’s why we’re reached out to our clients to give the real skinny on everything they need to know about the Canine Influenza Virus. Have there been confirmed cases locally? As of the time of this article our office has not had any confirmed cases of either strain of the Canine Flu and neither have any other local veterinarians. However, the North Carolina Veterinary Medical Association reports confirmed cases in surrounding areas, as well as two suspected deaths. Is my dog in danger of catching the Canine Flu? As right now, we are recommending the vaccine for our most social pets, as they would be most at risk for potential exposure and canines who may be traveling the areas where the Canine Flu is more prevalent. Canines participating in Dog Shows and other competitions as well as any canines that visit training, grooming and boarding facilities are most likely to be exposed to the virus. How is it spread? The virus is spread from infected dogs to other dogs through direct contact, nasal secretions (through coughing and sneezing), contaminated objects (kennel surfaces, food and water bowls, collars and leashes), and people moving between infected and uninfected dogs. Infected dogs show clinical signs within 24-48 hours and can shed the virus for up to 28 days from exposure. What are the signs and symptoms? The signs of canine flu are cough, runny nose and fever and are similar to other respiratory problems. Other signs can include lethargy, eye discharge, reduced appetite and low-grade fever. Most dogs recover within two to three weeks. However, secondary bacterial infections can develop, and may cause more severe illness and pneumonia. Anyone with concerns about their pet’s health, or whose pet is showing signs of canine influenza, should contact their veterinarian. Is Town ‘N’ Country going to carry the vaccine? In short, yes! We want our most vulnerable patients to be afforded the best possible protection. That’s is why we will be carrying the Merck Bivalent Canine Influenza Vaccine. This vaccine has been proven to aid in protecting pets from the worst possible outcomes associated with both known strains of the Canine Flu, such as secondary pneumonia. Pet owners considering vaccination should contact our office to see if it is right for their pet. You decided you’d like to vaccinate- what to do next: Call us to consult on the subject and add your name to our waiting list. We expect the vaccine to arrive this week. 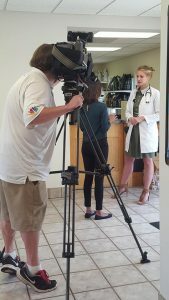 FOR MORE INFORMATION Watch Dr. Bolynn on the WXII Evening News. I am a regular client of T&CAH and have been for many, many years! 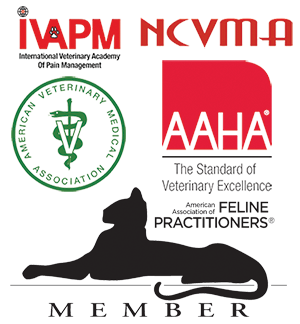 I am proud to say I see the veterinarians there when speaking with my friends! I am often asked which vet I go to. Kaye J.